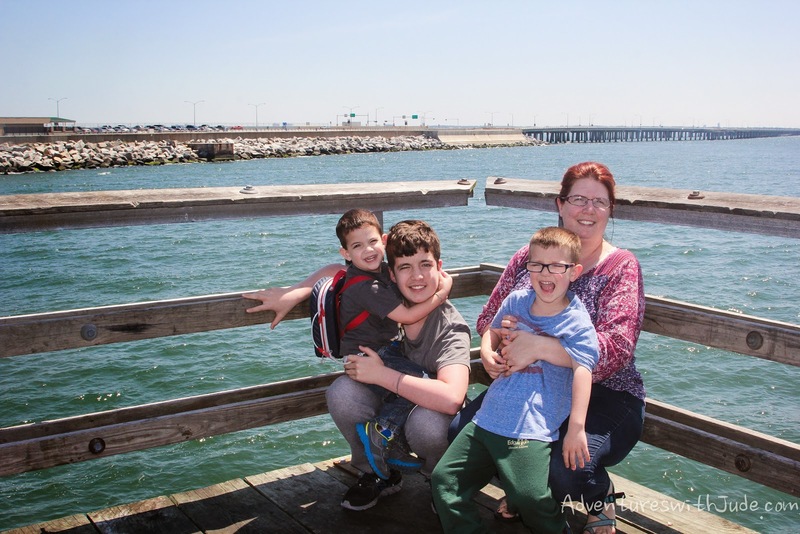 Every Thanksgiving and Easter, my family drives to Florida for vacation, and we usually drive directly up I-95 to get home, crossing the Chesapeake Bay via the Fort McHenry Tunnel in Baltimore. Driving home is usually a two-day trip due to very heavy traffic, and we get up to Richmond, Virginia on Sunday morning and say, “Oh, sometime we ought to go home over the Bridge-Tunnel,” but rarely think of it before a more convenient place to detour. 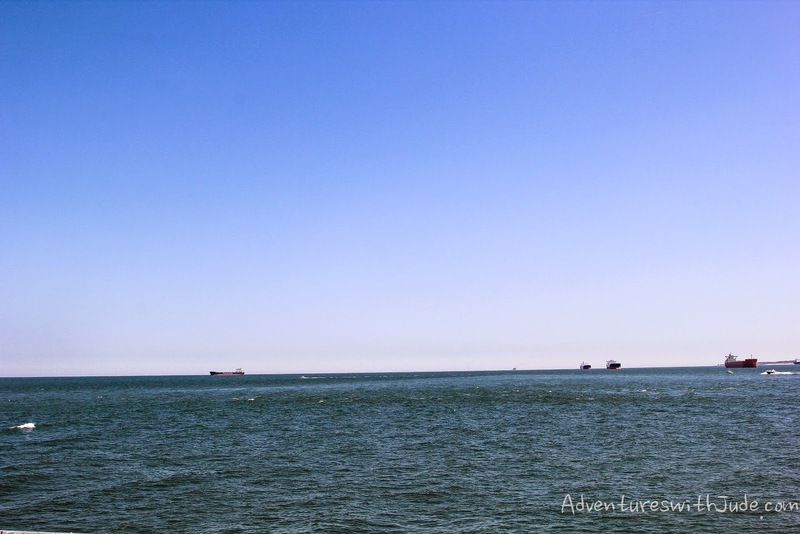 This Easter’s trip, however, the traffic on Saturday was surprisingly light, and since we weren’t in the “Let’s just get home already” mindset, we decided to alter our route home to include the Chesapeake Bay Bridge-Tunnel. What seemed like little more than a detour and a restroom stop became an interesting miniature history and geography lesson. The Lucius J. Kellam, Jr. Bridge-Tunnel, operated by The Chesapeake Bay Bridge and Tunnel Commission, is a four-lane, 20-mile-long toll crossing over the lower Chesapeake Bay. Using US 13, the main north-south highway on the Delmarva peninsula, it provides the only direct link between Virginia’s Eastern Shore and mainland Virginia. The route consists of three low-level bridges alternating with two approximately one-mile-long tunnels beneath the Thimble Shoals and Chesapeake navigation channels, along with high level bridges at the northern end over the North Channel and Fisherman Inlet. At the southern mouth of each tunnel is a 5 ½ acre rest area and fishing pier. The roadway also provides access to Fisherman Island National Wildlife Refuge, a barrier island preserve maintained by the U. S. Fish and Wildlife Service. Tolls are collected when the car enters the Bridge-Tunnel, with southbound tolls collected on the north shore and northbound tolls at the south end. Prior to the early 1930s, bay crossings were conducted by private arrangements between ship captains and passengers. In the 1930s, the Little Creek-Cape Charles Ferry began a scheduled ferry service, but eventually the demand for crossings exceeded the bay’s ship capacity. Keep in mind, the Chesapeake Bay was - and still is - a major marine entry to the United States. Along the Chesapeake Bay itself are the ports of Norfolk/Hampton Roads, VA, Annapolis, MD, Baltimore MD, with many smaller ports between those. Eleven rivers feed the bay and serve as access to larger nearby cities such as Richmond, VA (via the James River) and Washington DC (via the Potomac River), while the Susquehanna River travels inland for nearly 500 miles from Havre de Grace, MD and the Chesapeake Bay to Lake Otstego in Cooperstown/central New York state. By 1954, 90+ daily ferry crossings plus incoming ships heading to ports meant the bay was becoming dangerously crowded with cross-traffic, and the Chesapeake Bay and Bridge Tunnel Commission was formed and construction on the bridges and tunnels began. 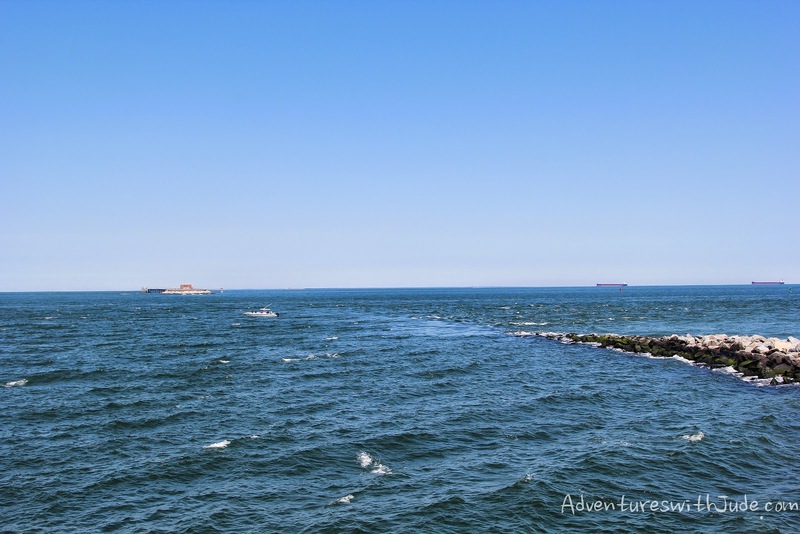 The ferry company disbanded upon the road’s completion in 1964, with much of the equipment transferred to the Cape May-Lewes Ferry (providing service across the Delaware Bay from New Jersey to Delaware). Upon opening, the new bridge-tunnel system was declared “One of the Seven Engineering Wonders of the Modern World,” and remains one of only ten bridge-tunnels in the world. This year, 2014, marks the Golden Anniversary of the Chesapeake Bay Bridge Tunnel. The original design was for a two lane bridge and tunnel, with one lane in each direction. Due to increases in traffic, a second two-lane bridge was constructed and opened in April 1999. The north and south bridges converge at the tunnels; a second, parallel tunnel at the Thimble Shoal Channel is currently planned. The original costs for the northbound bridges and tunnels were nearly $200 million and took 42 months to build. The newer southbound span required 46 months to construct and had a $250 million price tag. Amazingly, zero tax dollars were used for the construction of either project. 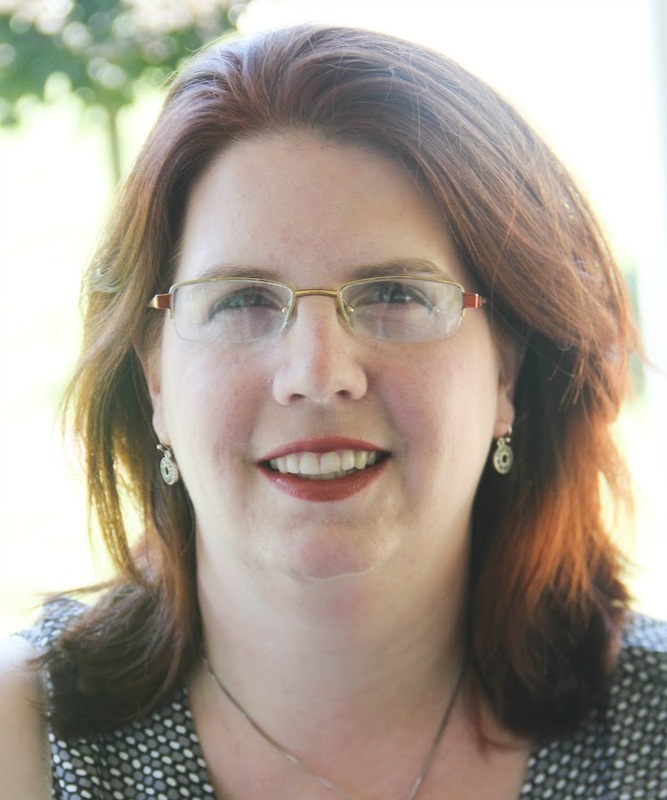 The original project was financed solely by revenue bonds, while the new southbound span received its funding from further bond sales along with financing from the Chesapeake Bay Bridge and Tunnel District. The tunnel was officially renamed in 1987 for Lucius Kellam, the Commission member who dedicated over 40 years of his life to the project, from initial conception of the project in 1954 until his death in 1995. 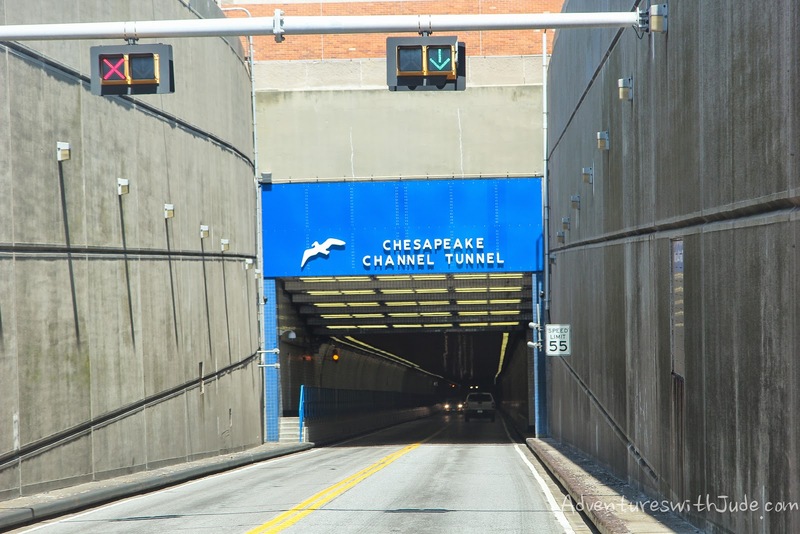 However, because the renaming came more than 40 years after the construction, it retains the moniker "Chesapeake Bay Bridge-Tunnel" for common usage. We entered the bridge at the southern toll plaza at Hampton Roads, VA. There was a short span of bridge until we reached the Sea Gull Island, at the mouth of the Thimble Shoal Channel tunnel. At this point is a rest area, the Virginia Originals gift shop, the Chesapeake Grill restaurants, and the Sea Gull fishing pier. 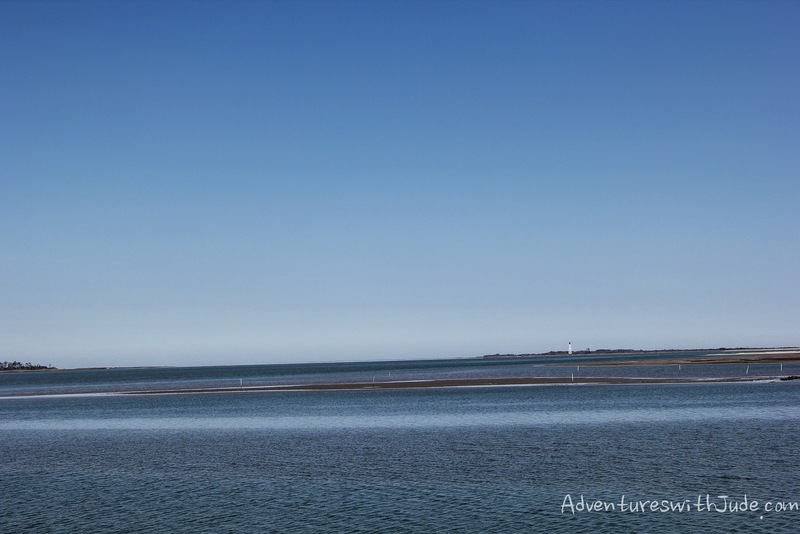 When we parked, we were on the "ocean" side and saw a number of ships working their way towards the bay. The Virginia Original shop sells gift items ranging from crafts made by local artisans to T-shirts while the restaurant is divided into two sections: a counter-service style sandwich/snack bar and a table service dining pavilion (hours range seasonally). 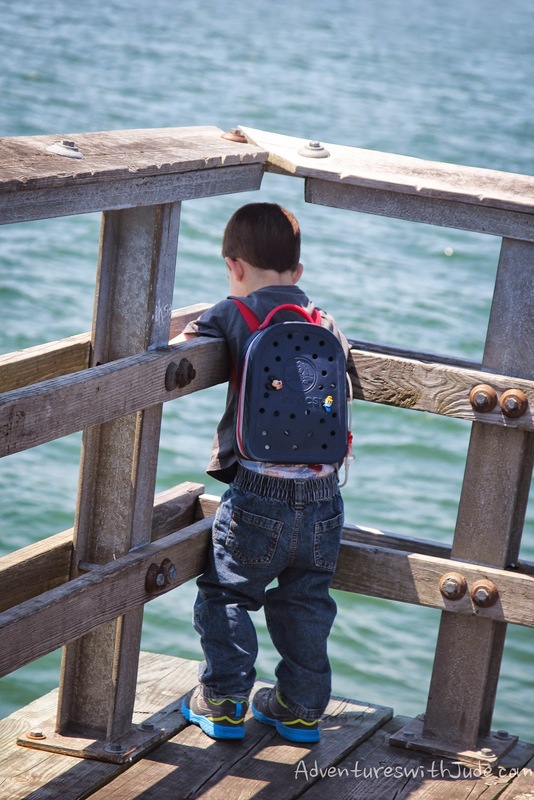 After using the restrooms (open to the general public), we ventured out onto the pier. 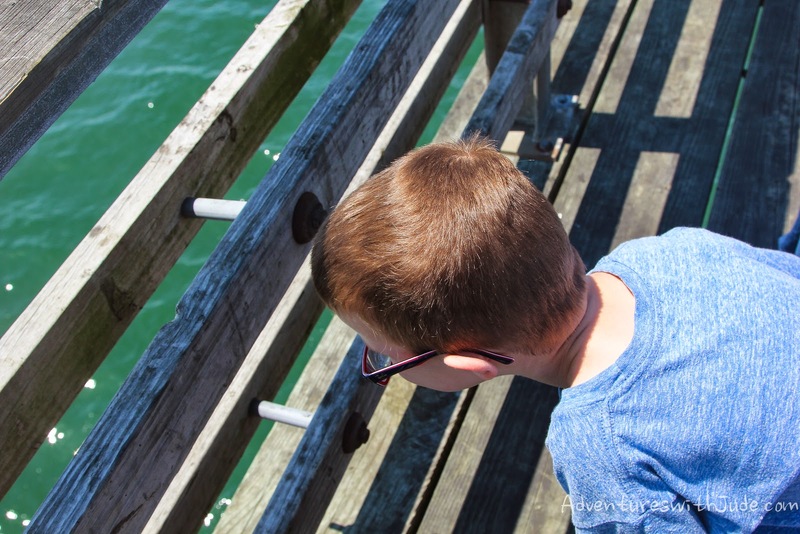 The 625-foot, wheelchair accessible Sea Gull fishing pier allows anglers to experience deep-sea fishing without needing a boat. 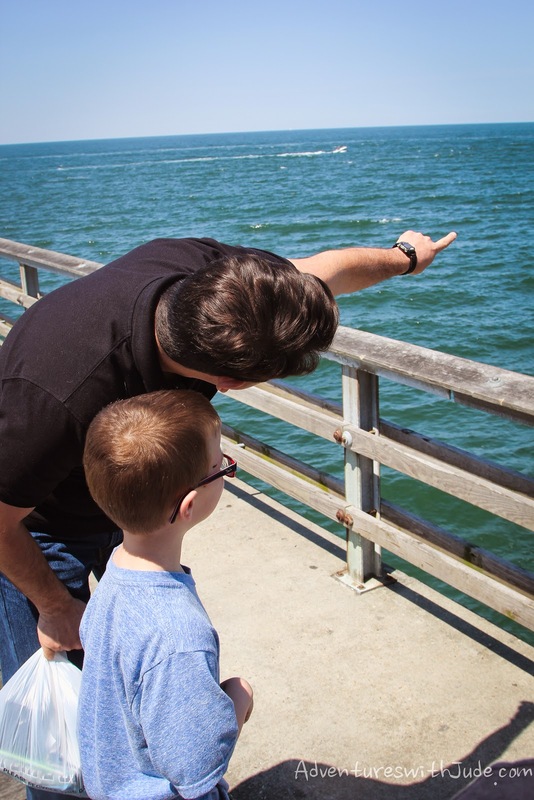 The fishing pier has 24-hour access, so you can fish any time you like! There is a bait shop, a certified weighing station, and complimentary cleaning stations on the pier. Once you pay the toll to enter the Bridge-Tunnel, there is no additional fee; a fishing license is not required, but if you intend to fish from the pier, you must register annually with the Virginia Fisherman Identification Program. Anglers are permitted unlimited casts, but may only use two rods maximum per person at a time. Even if you’re not intending to fish (we weren’t! 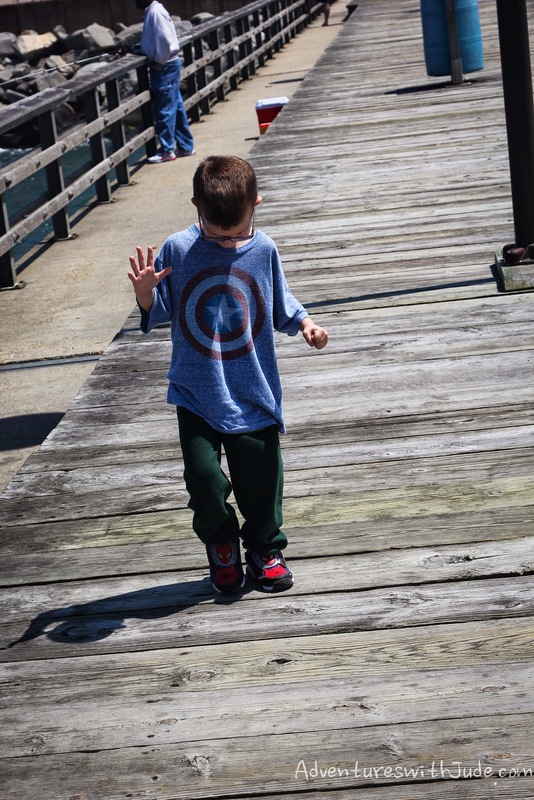 ), a walk along the pier is a beautiful way to experience the Chesapeake Bay. When we were there, the day was clear enough to see for several miles across the bay. The side walks of the pier were concrete. The center was more of a "boardwalk" construction, with gaps between the boards. Looking down and seeing water beneath him made Jude a little nervous. 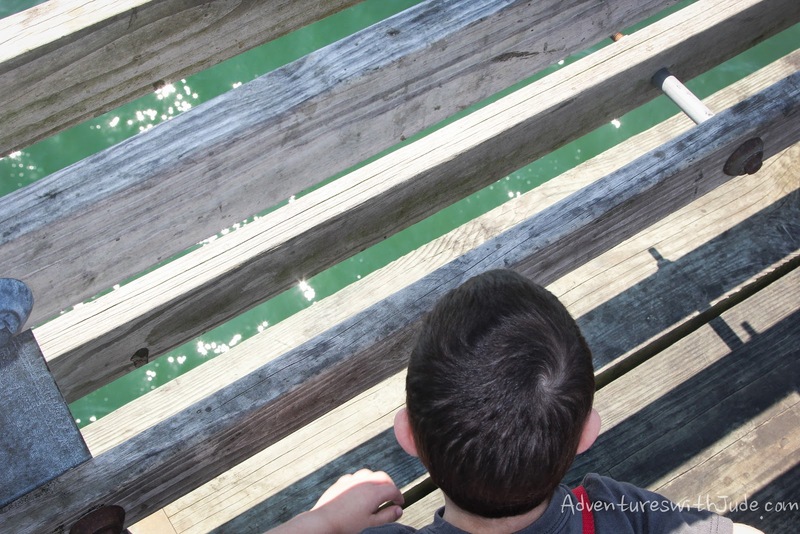 The best way to be distracted from a fear of bridges and tunnels -- worry about a child going off the pier! 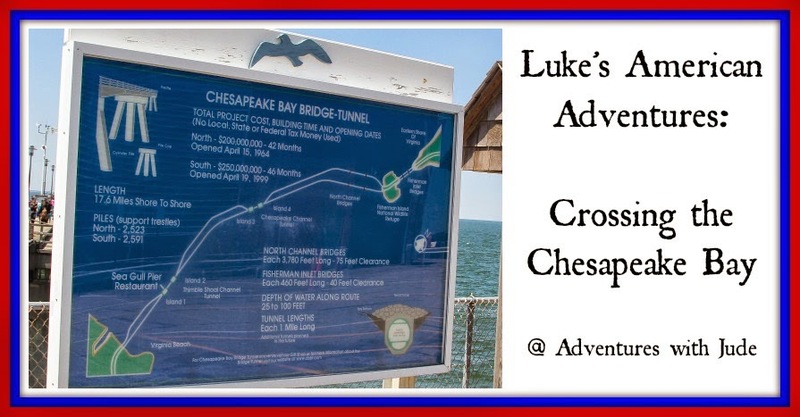 There is also a second pier at the southern mouth of the Chesapeake Channel tunnel. However, it was closed to visitors when we were there. While there are a few emergency parking spaces for travelers, the bulk of the parking and the buildings are used for official business (Bridge-Tunnel Police, etc.). One thing that these tunnels do that I've never experienced before is how the tunnels are lit. They are extremely bright as you enter, dim as you approach the center, and gradually increase in brightness towards the exit. Because the brightness changes are gradual, it definitely is easier for your vision to adjust when you enter and emerge from the tunnel. There is a second Rest Area with Overlook at the edge of the Delmarva peninsula. 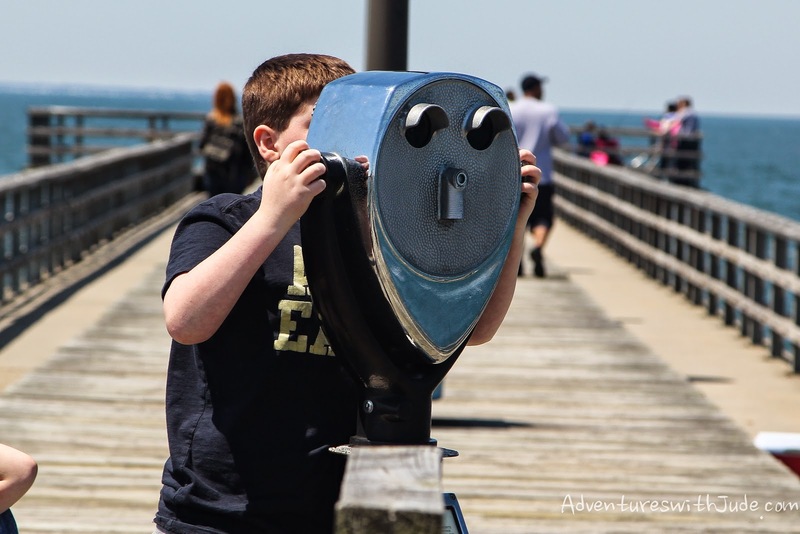 This area has restrooms, vending machines and another magnificent view of the Chesapeake Bay. We opted not to stop there but to continue on to Virginia’s Eastern Shore and head towards home. We vacation in Virginia Beach about every other year and we always talk about driving through that bridge tunnel, but we never do. 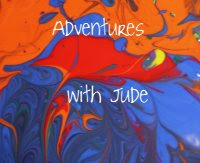 I think we're going back this year -- I am going to make sure we do this! Thanks for history lesson. I'm going to pin this so I don't lose it when we go! 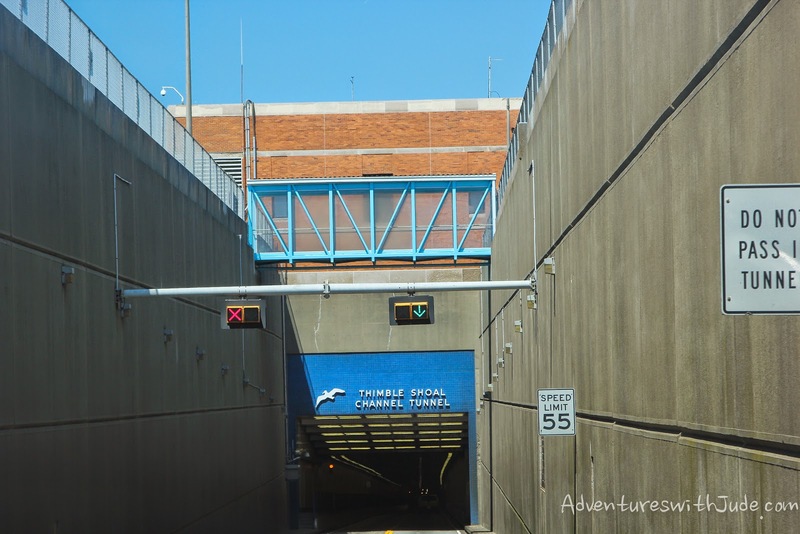 The Bridge-Tunnel is the only one I know of that has a rest stop in the middle of it, but there are several tunnels on the East Coast. There's also the Ft. McHenry and Harbor Tunnels in Baltimore (which also go under the Chesapeake), the Lincoln Tunnel (under the Hudson River from NJ to Manhattan/NYC), and a number of tunnels in Boston. There's lots of water around here to go under!